This day, this very day, my twin granddaughters turn 11! And like many children they both like animals. One likes piggies, and one likes DUCKS. When I saw this Unity stamp I had to buy it. It was almost someone was pushing me toward the computer, and clicking on the various buttons that buy this NOW!! I used the same Salad Spinner technique for the background (look at my September 1, 2017 post for complete directions), and I used my Copic markers to color in the image. the puddles and the grass were sort hand colored and sort of sketched in. 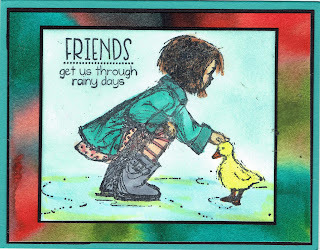 This is a cute card for one of my 5 cute granddaughters! Every now and then you need a quick card to send to someone who is just having a rough time in this game we call life. They may or may not be "sick" -- but you know things are not making them say, "Oh hooray, this is happening to me to me now." 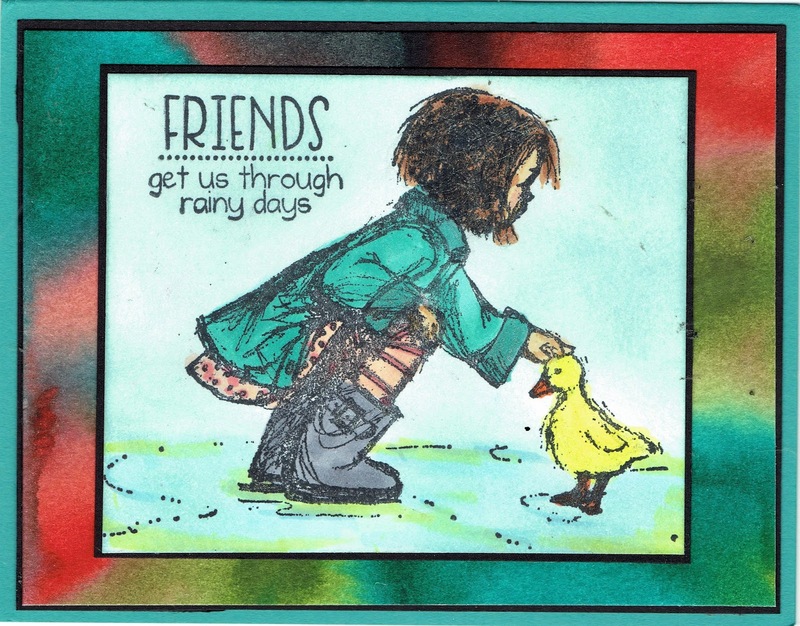 I used two Technique Junkies stamps - Paint Rings - techniquejunkies.com/paint-rings/; and Play in the Puddles - http://techniquejunkies.com/play-in-the-puddles/ . This is such a simple to create a card with impact. Both stamps were heat embossed with white pigment ink and white detail embossing powder. 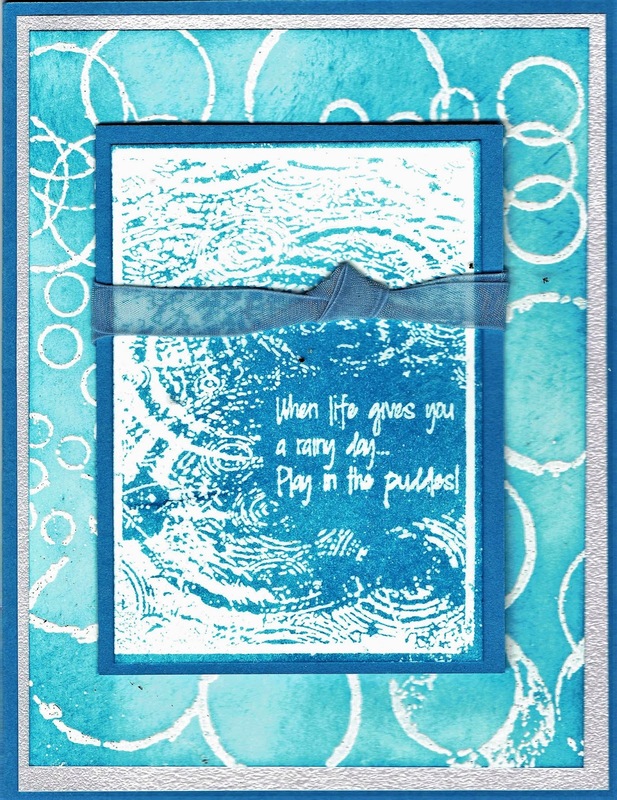 Then because "puddles" makes you thjink of rain puddles I used blue dye based ink. I used a sponge and burnished .ink all over the stamped image. I burnished and burnished until I was happy with the intensity of the color. Then the images were matted and arranged on the base card. 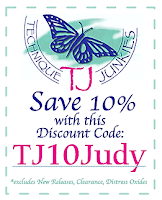 And remember you can get an addition 10% discount with this code - TJ10Judy. I used three Technique Junkies stamps to create this card. The background stamp is a November release called Violin collage - techniquejunkies.com/violin-collage/ . I stamped it on white card stock and embossed it with clear embossing powder over Versamark ink. Then I sprayed a variety of color of Art Anthology Colorations sprays - http://techniquejunkies.com/products-and-accessories/art-anthology-products/ . Then I blotted off the excess. Next I used a small piece of white card stock sprayed with the same variety of Art Anthology Colorations sprays as above. After it was dry I stamped The Saxophonist - http://techniquejunkies.com/the-saxophonist/ , and Life is A Song - http://techniquejunkies.com/life-is-a-song/. Both stamps were stamped with black Versafine ink and heat embossed with detail black embossing powder. The focal image was trimmed and mounted, Stick on embellishments were used. 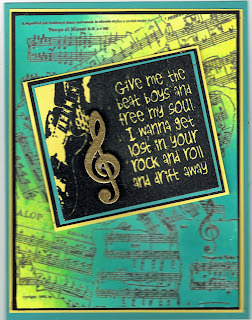 Have a wonderful musical day, and get inky! Give Me the Beat Boys! I sprayed white stock with several colors of Colorations spray from Art Anthology products - http://techniquejunkies.com/products-and-accessories/art-anthology-products/ . Then I stamped Technique Junkies November release stamp Torn Music Collage - techniquejunkies.com/torn-music-collage/ - with black ink. The focal image Technique Junkies Free My Soul - http://techniquejunkies.com/free-my-soul/ - was stamped with black Versafine ink and heat embossed with clear embossing powder. The treble clef is a purchased music embellishment. I pressed it into my Versamark pad and covered it with detail gold embossing powder. I did this several times to ensure a thick coat that would be smooth when completed. It is attached with glue dots. Hoping for a wonderful day for each of you, and that you are getting inky. 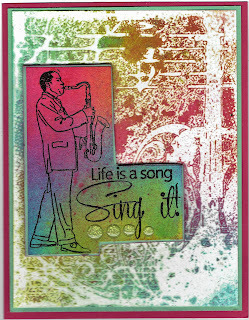 The Technique Junkies background stamp is called Sudsy Stuff - http://techniquejunkies.com/sudsy-stuff/ . I inked up the stamp with a gray ink on blue card stock. 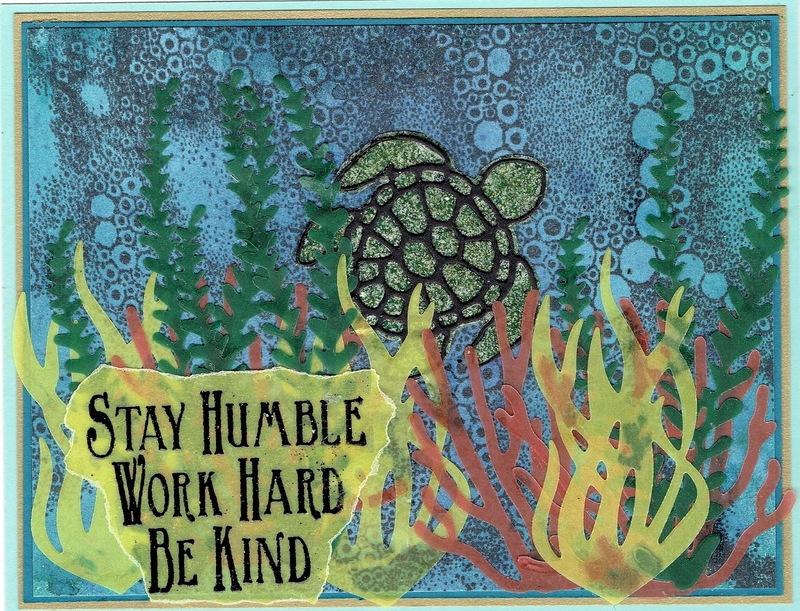 I added die cut ocean plants, and a die cut sea turtle. I placed the turtle die cut on sticky embossable table and added several shades of embossing powder, and heat set the turtle. Then I pressed a Versamark pad on the turtle and covered it with clear embossing poweder. I did this several times so to look at the turtle it almost appears to be glass. I stamped the Technique Junkies November release stamp Stay Humble - techniquejunkies.com/stay-humble/ - on yellow vellum. I stamped with a black Versafine ink and embossed it with clear embossing powder. The edges were torn and then adhered with adhesive from a Xyron machine. Hope your day is just terrific, and get inky! 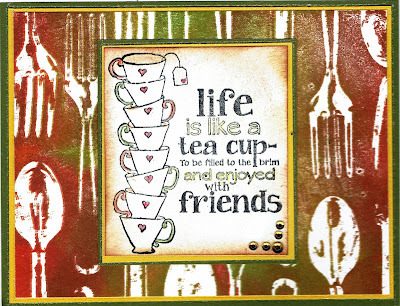 Life is Like A Tea Cup! 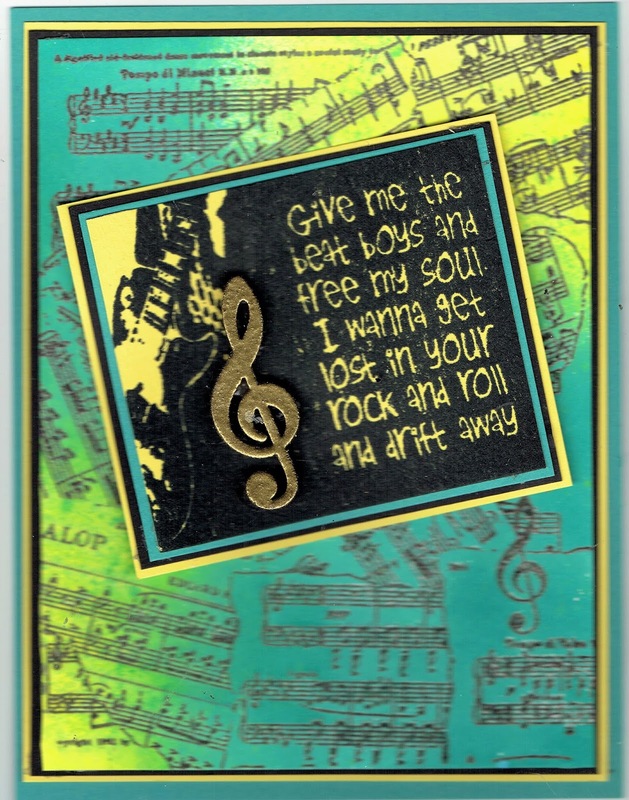 I used two different Technique Junkies stamps to create this fun card. The background stamp is a November release stamp called Flatware - techniquejunkies.com/flatware/ . The background is inked up a Kaliedacoloor ink pad. The focal image is Like a Teacup - http://techniquejunkies.com/like-a-teacup/ . It is colored with Copic markers. 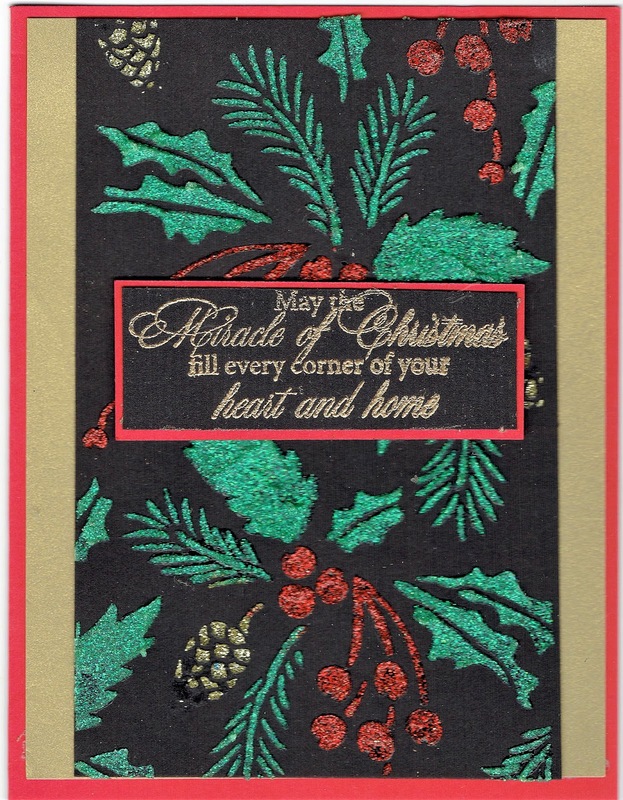 Layers, sponging, and embellishments finish the card. I saw a similar card somewhere out there on the internet and I honestly do not remember where. I used two Technique Junkies Stamps on this card: Hillside Pines - http://techniquejunkies.com/hillside-pines/ , and Good Night - www.techniquejunkies.com/good-night/ . First I created a moon mask but punching a circle from two "all over" sticky note paper. Two are needed for stability. Then I swirled dark blue ink all over the white card stock.Then I spritzed a glimmer spray with pearl colored Perfect Pearls for the stars in the sky. I rubbed over the card stock with an Embossing Buddy because I didn't want any stray powder to become heat embossed on my next step. I used only the tallest tree on the stamp Hillside Pines - http://techniquejunkies.com/hillside-pines/. I inked it first with Versamark, and then inked it with a dark mossy ink. I started in the center of the bottom of the panel. , Then I cleaned the stamp, and repeated for every tree stamp you see here. The goal was to create a scene where the person would be lying down on a blanket and looking at the night sky above him/her. I covered the ink with clear embossing powder. Then I took my finger tip with a very small amount of white pigment ink and gently smeared a light amount of ink in a circular motion around the masked moon. Then I removed the mask from the moon, and stuck on a few bright white stars. The greeting is heat embossed with white embossing powder. And remember you can get a 10% discount with this code - TJ10Judy. Have a wonderful brisk day, and get inky! 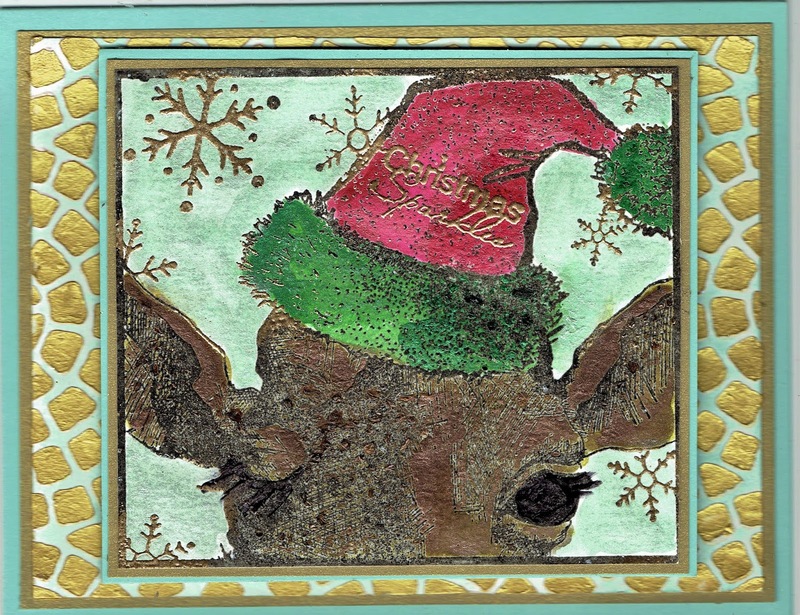 Christmas Sparkles - 30 Days of Christmas Card for 2017 - The Last One! 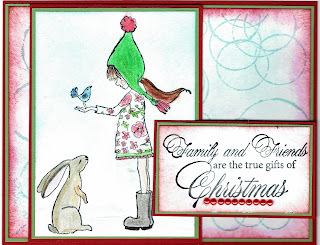 From October 15 thorough November 13 Technique Junkies Stamps is celebrating 30 Days Of Christmas! All Technique Junkies Christmas stamps are 20% off during this event! And if a customer uses my TJ10Judy code, the customer can receive an ADDITIONAL 10% off! Be sure you go and see what the Design Team is doing at https://techniquejunkies.blogspot.com/ . 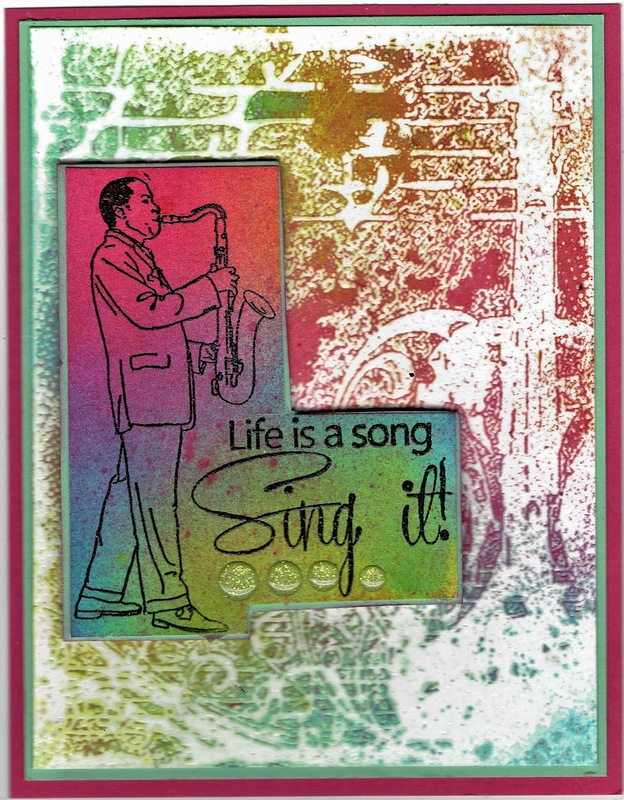 The background was created with a stencil from A Colorful Life STencils - http://techniquejunkies.com/circle-mosaic-stencil/ and gold Nuvo Mousse - http://techniquejunkies.com/products-and-accessories/nuvo-mousse/ . The mousse dries very quickly so it was not long before I could burnish the spaces in between with light aqua ink. , and a part of a verse from Christmas Ornaments Trio on the hat - http://techniquejunkies.com/christmas-ornaments-trio-set-of-9/ . The focal image was painted with Twinkling H2Os. Merry Christmas to all of you! My Christmas cards are done and ready to mail. 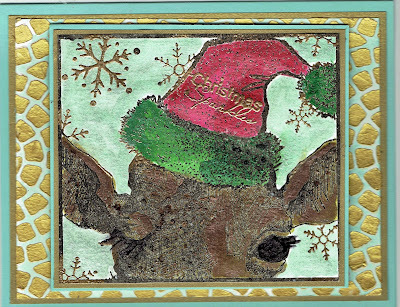 I hope you have been inspired by my cards for these 30 Days of Christmas. During the 30 days of Christmas, every stamp in the Christmas category is 20% off. AND every customer can use my discount code – TJ10Judy for an additional 10% discount! That means if you use my code you would receive 30% off all Christmas stamps. And if you see stamps you want that are not Christmas , using the TJ10Judy code will get 10% off of everything else that isn't Christmas. This is the very last day for this double discount! So get shopping, stampers! Have a happy day, and get inky! 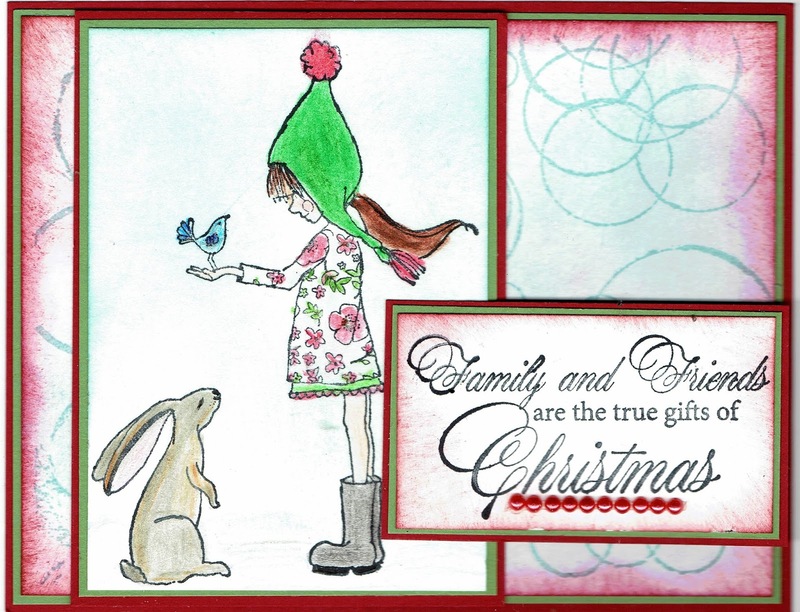 From October 15 thorough November 13 Technique Junkies Stamps is celebrating 30 Days Of Christmas! All Technique Junkies Christmas stamps are 20% off during this event! And if a customer uses my TJ10Judy code, the customer can receive an ADDITIONAL 10% off! Be sure you go and see what the Design Team is doing at https://techniquejunkies.blogspot.com/ . Tomorrow is the last day for the 30 Days of Christmas so I hope if you have not shopped for Christmas stamps, you will by tomorrow! This is the only 30 days when you can double coupons and get 30% off of all Technique Junkies Christmas stamps, and don't we all just love a bargain! This is another 5x7 card in order to get all of the elements in place. 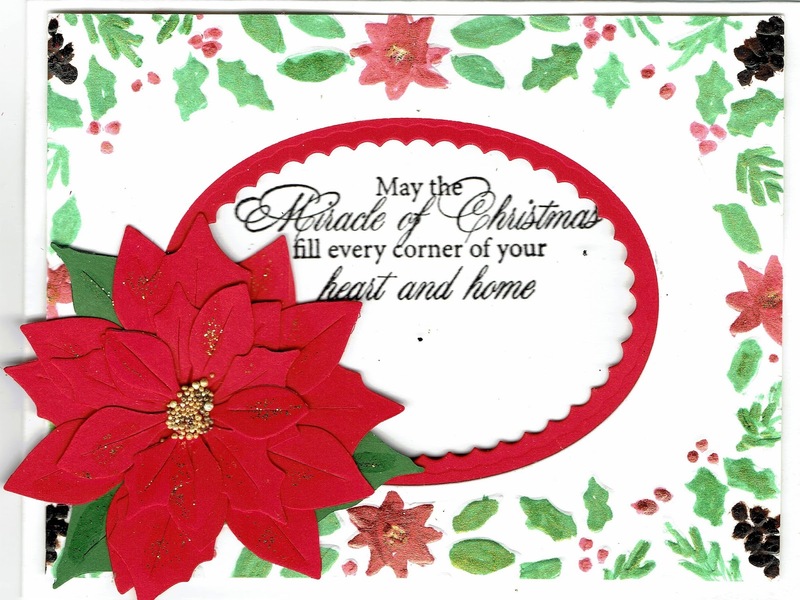 And this is a Bendy card -- inspired by Beth Norman's Bendy card on the Design Junkies blog - http://techniquejunkies.blogspot.com/2017/11/30-days-of-christmas-day-24-bendi-fold.html . Tutorials for Bendy cards are on several places on the internet and easy to find. 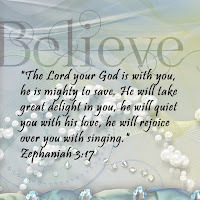 I just googled it and found links on you tube, Splitcoast Stampers, and Pinterest. So choose the one that makes the most sense to you. I die cut the stars in the top after the navy ink was burnished. Next time I would do it first. Stamp Technique Junkies stamps Santa in the Moonlight - www.techniquejunkies.com/santa-in-moonlight/ - first. Then cut a circle mask that is 1 7/8th inches in diameter. Place the mask over the moon. And then burnish the white stock with the navy ink. Create bendy parts from whatever house dies you have and follow the directions for whatever tutorial you chose. Bendy cards are just fun to make, time consuming but fun! During the 30 days of Christmas, every stamp in the Christmas category is 20% off. AND every customer can use my discount code – TJ10Judy for an additional 10% discount! That means if you use my code you would receive 30% off all Christmas stamps. And if you see stamps you want that are not Christmas , using the TJ10Judy code will get 10% off of everything else that isn't Christmas. So get shopping, stampers! 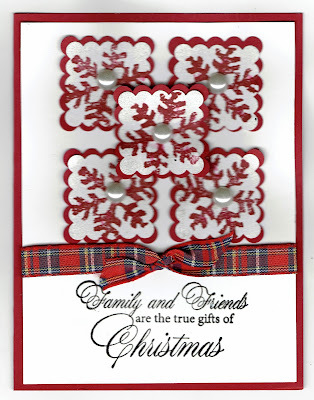 Have you placed your Technique Junkies Christmas stamp order yet? You only have one more day left! Have a stamping good day, and get inky! Two Technique Junkies Stamps are using on this card. One is Country Church - http://techniquejunkies.com/country-church/ , and Gifts of Christmas - www.techniquejunkies.com/gifts-of-christmas-set-of-5/. 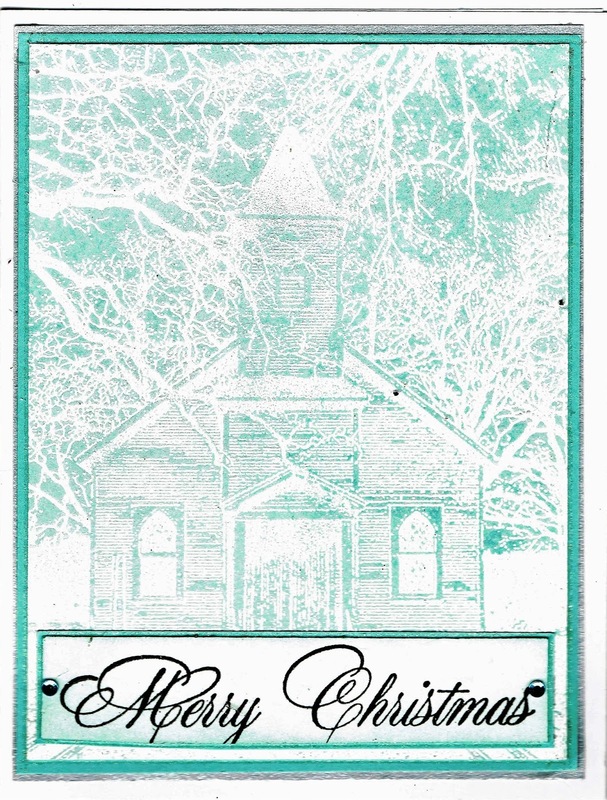 I heat embossed the church with detail clear embossing powder on white card stock. Once it had cooled (as I didn't want to smear the hot embossing powder) I burnished the entire scene with a light aqua dye based ink. I burnished and burnished until all of the details helped the white to stand out in relief. I only used the two words from one of the verses in the Gifts of Christmas set - www.techniquejunkies.com/gifts-of-christmas-set-of-5/. 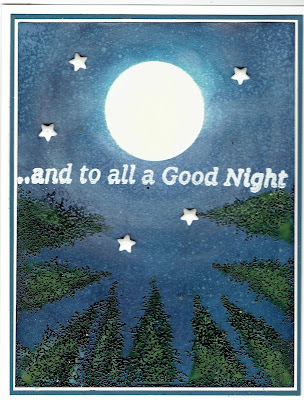 The focal image and the greeting were layered on aqua card stock. Two more days and I will share my last TJ 2017 ~ 30 Days of Christmas card with you! I hope you are shopping, Stampers! I used Technique Junkies Gifts of Christmas stamps - www.techniquejunkies.com/gifts-of-christmas-set-of-5/ and heat embossed the chose verse with detail gold embossing powder. I used a stencil with seasonal foliage and Art Nuvo Glimmer Paste - http://techniquejunkies.com/products-and-accessories/nuvo-glimmer-paste/ . This dries fairly quickly but you really want to let it sit for a while especially because you adding quite a bit of the glimmer paste to get the details. I framed the focal panel with gold card stock and adhered it to the red base card. Hope your days are wonderful and that you are getting inky! This card was fun to make. I used an embossing folder, and die cut to cut out the center. I die cut a scalloped oval from a red piece of card stock for the center. The verse - which is from TJ Gifts of Christmas - www.techniquejunkies.com/gifts-of-christmas-set-of-5/ - was stamped on a white panel and centered under the red scalloped oval. The foliage was painted with Smooch paints, and the poinsettia was die cut. I added some gold glitter Smooch paint and some yellow Prills for the center. Please do not forget that TODAY is the LAST day you can get the 15% off discount (comes off automatically) for all of the Technique Junkies Stamps November releases. 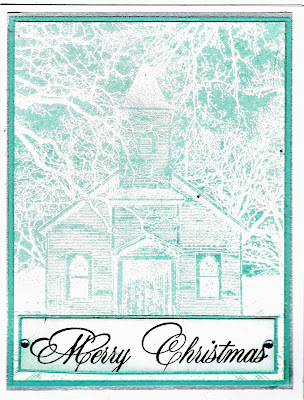 During the 30 days of Christmas, every stamp in the Christmas category is 20% off. AND every customer can use my discount code – TJ10Judy for an additional 10% discount! That means if you use my code you would receive 30% off all Christmas stamps. And if you see stamps you want that are not Christmas , using the TJ10Judy code will get 10% off of everything else that isn't Christmas. So get shopping, stampers!. Today I have a special fold card to share with you. It uses one of my favorite Technique Junkies stamp for the focal image. It is also a larger than usual card in order to get all I wanted to do on this card. It is a 5x7 card. There will lots of instructions for you as well. The Technique Junkies stamp I used is Stars Are Brightly Shining - http://techniquejunkies.com/stars-are-brightly-shining/. 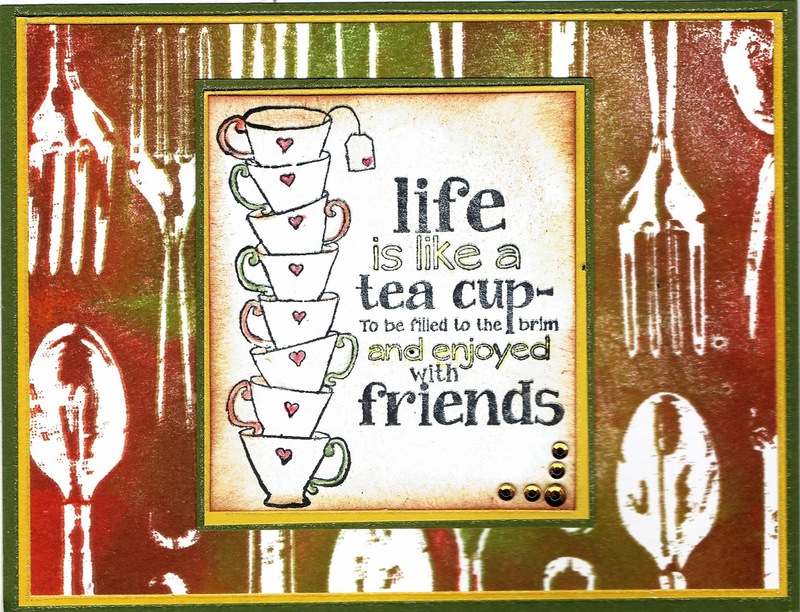 The focal image stamp is tamped with Versamark ink and heat embossed with clear embossing powder on a sheet of white card stock measuring 4 1/8 inch by 6 1/2 inches. I used the MISTI - http://techniquejunkies.com/misti-most-incredible-stamping-tool-invented/ - and stamped it twice to be sure all of the image was truly inked. Then I sprayed various shades of green and blue Art Anthology Colorations sprays - http://techniquejunkies.com/products-and-accessories/art-anthology-products/ - to get the grassy hills and the night sky. I also used some glimmer spray for the stars. This card folds flat for mailing. 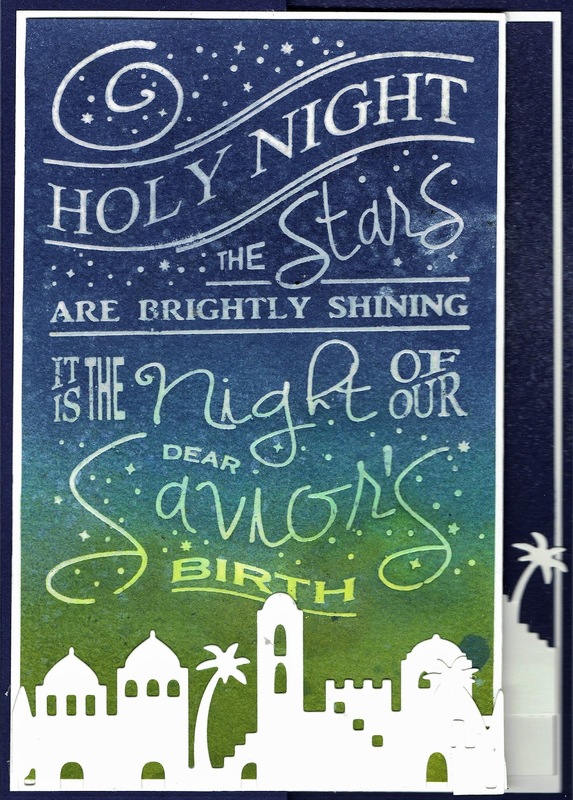 I used three die cuts of the buildings in Bethlehem, the star, and one of Mary and Joseph. There is one building scene die cut on the front, and two on the inside. Those are over lapped and one is raised up a bit with a small piece of white card stock scrap to make it even at the bottom. Here you can see the inside and how it is folded. 1. The dark blue card stock for the base card is cut at 7 x 10 inches. 2. Score at 2 1/2 and at 7 1/2 inches. Fold as you see above. 3. The interior white card stock is 6 3/4 x 9 3/4 inches. 4. Score at 4 1/4 inches. Flip the card stock over and score from the left edge at 6 3/4 inches. 5. Cut two dark blue panels - one piece is 2 3/8 x 6 5/8 inches, the second piece is 2 7/8 x 6 5/8 inches. 6. Adhere the dark blue panels on the inside white card stock in the appropriate place (where they fit of course). 7. I adhered the Bethlehem building scene die cuts, trimming where necessary to fit. 8. Use a firm tape runner adhesive on the back of the inside (where the star will be placed) and adhere it the dark blue base card stock at the edge leaving a dark blue border on all three sides. 9. Then use a firm tape runner to adhere adhesive on the back of the front panel only 2 1/4 inches from the edge and down the length of the panel. Adhere it to the front panel leaving a border along three edges. It is helpful at this point to fold the card flat as you adhere this panel. It ensures the card really does fold flat. 10. Then I adhered the die cut of the star and Mary and Joseph on the inside panel where they will not show when folded. 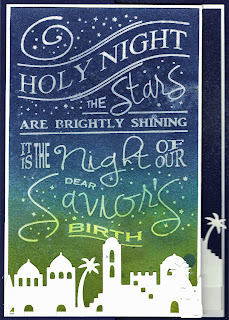 I pressed the star onto a Versamark pad and dipped it in glittery white embossing powder and heat set. It is a bit of a fussy card but I think it is a dramatic card. I will send this to my sister-in-law who lives in assisted living and doesn't have much room for any seasonal decorations. So she can display this. 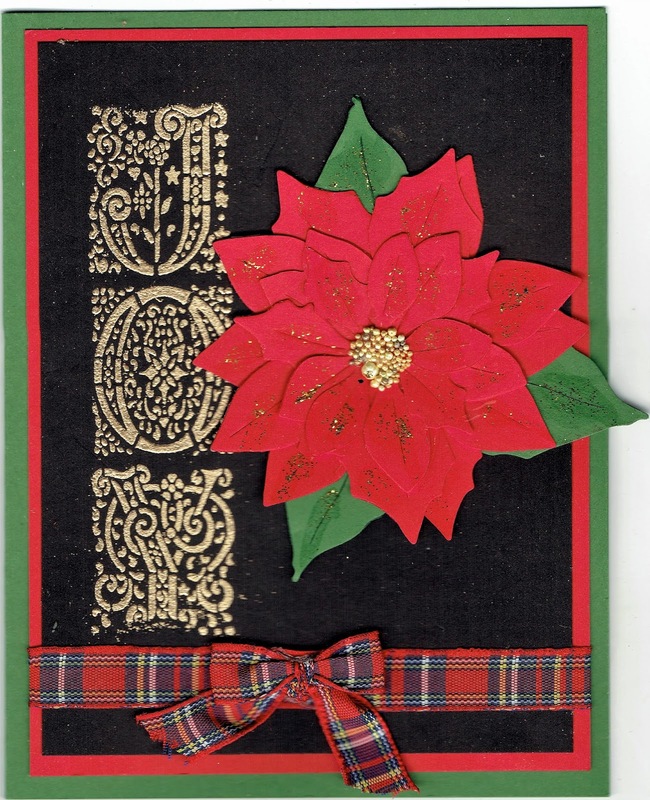 Have you placed your Technique Junkies Christmas stamp order yet? You only have a few days left! Have a wonderful day, and get inky. 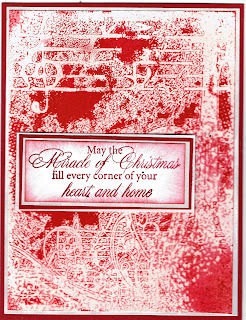 I used the JOY panel stamps from Technique Junkies Stamps Christmas Words Set - http://techniquejunkies.com/ss029-christmas-words-set-of-4/ . I inked it up with Versamark ink and used detail gold embossing powder to heat emboss the word on black card stock. 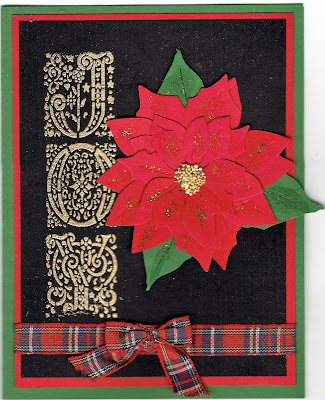 I used a die cut poinsettia and added some gold Smooch glitter. The stamens in the center are yellow Prills. A plaid bow adds just the right touch to finish the card! Have a sparkly day -- and get inky! 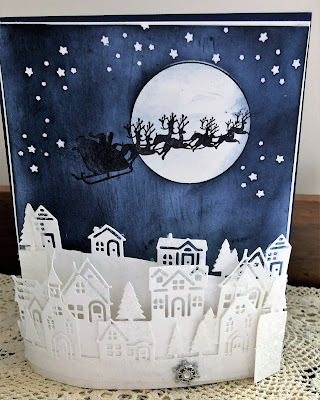 From October 15 through November 13 Technique Junkies Stamps is celebrating 30 Days Of Christmas! All Technique Junkies Christmas stamps are 30% during this event! Be sure you go and see what the Design Team is doing at https://techniquejunkies.blogspot.com/ . 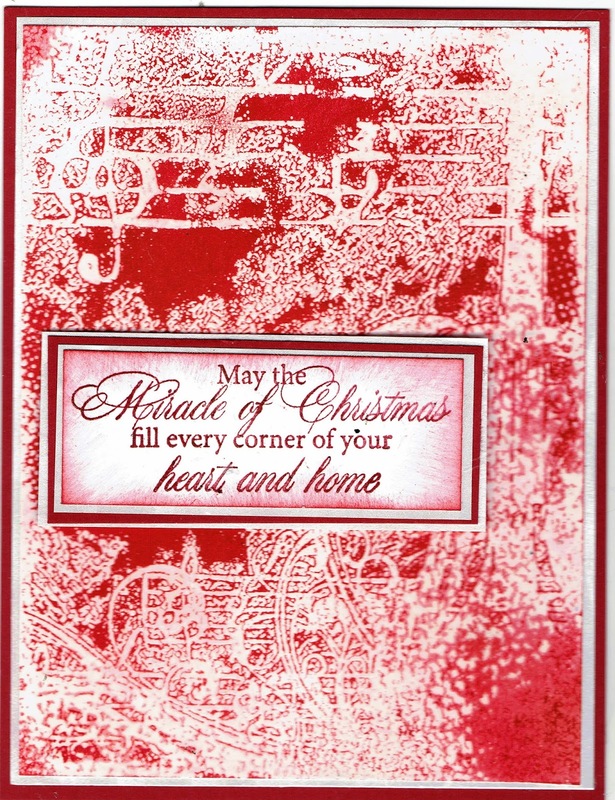 I used two Technique Junkies stamps to create this card: Christmas Sponge Set - http://techniquejunkies.com/christmas-sponge-set/ , and Gifts of Christmas - www.techniquejunkies.com/gifts-of-christmas-set-of-5/ . 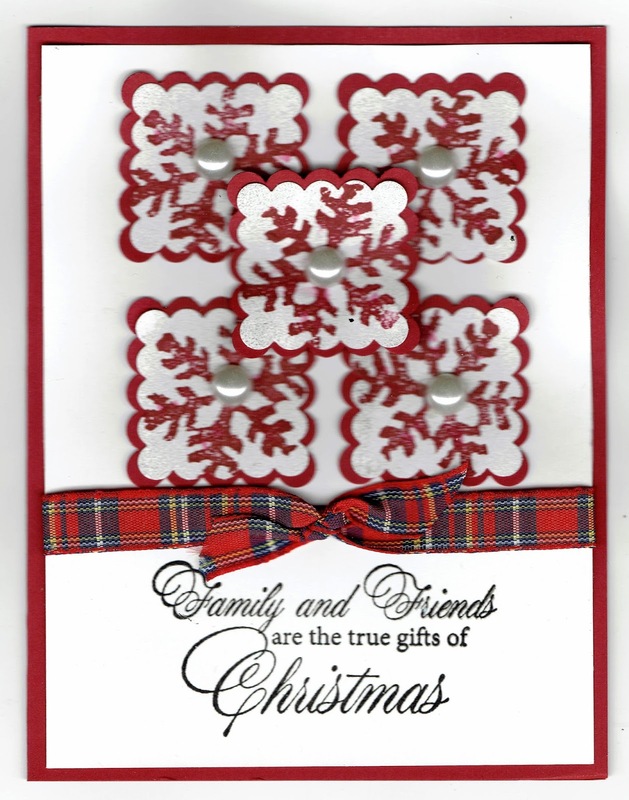 I stamped 5 snowflakes on white card stock, and die cut them out with a small scalloped die. Then I die cut 5 small scalloped squares a little big bigger. I measured and placed them evenly in two rows, and finished with one square in the middle. A pearl in the center of each square and a ribbon finish the card. The verse is heat embossed with detail black embossing powder. And don't forget there is a 15% off automatic discount on all of the Technique Junkie Stamps November releases! Whaoo! I love a bargain! Have a wonderful day and get inky. Happy November! New Stamps! New Blog Hop! And 30 Days of Christmas Continues! Happy November! This is our November blog hop celebrating the November release of some wonderful stamps from Technique Junkies. This is a lovely new Technique Junkies stamp called Violin Collage - techniquejunkies.com/violin-collage/. This is a very simple card, I inked the stamp with Versamark, and then covered the wet ink with clear embossing powder. When the powder was cool, I burnished red ink over all of the exposed white card stock. I stamped the verse Technique Junkies Gifts of Christmas - www.techniquejunkies.com/gifts-of-christmas-set-of-5/. Music reminds me of Christmas - does it you? This is an elegant and easily reproducible Christmas card. 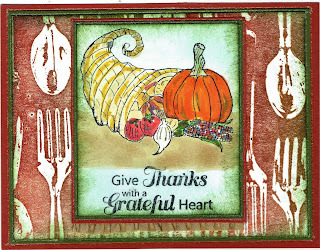 This Thanksgiving card uses a new Technique Junkies November release called Flatware -- techniquejunkies.com/flatware/. 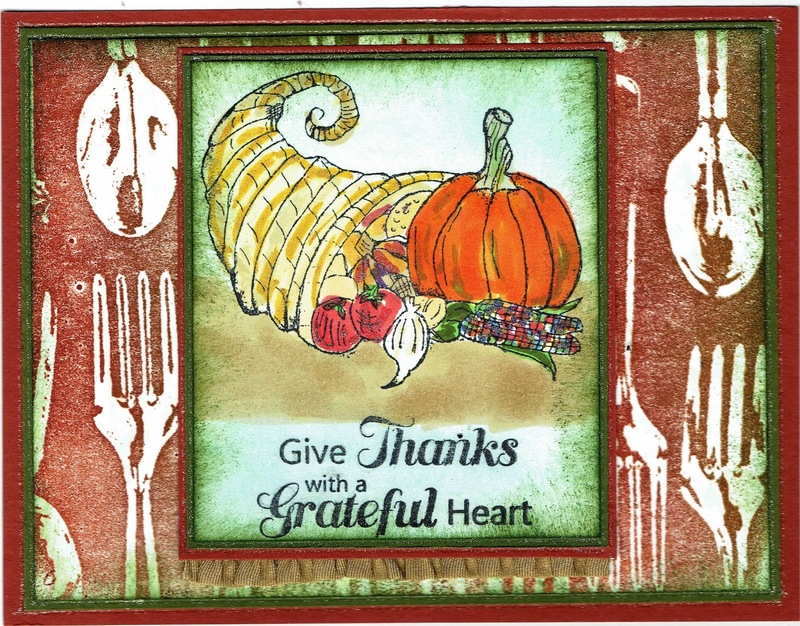 I also used another Technique Junkies stamp called Thanksgiving Blessings - http://techniquejunkies.com/thanksgiving-blessings-set-of-5/ . I inked the background with a Kaliedacolor pad - and the MISTI (http://techniquejunkies.com/misti-most-incredible-stamping-tool-invented/ ) - making sure I had enough ink on the stamp. The focal image was colored with my Copic markers. This next card uses 2 new November Release Technique Junkies Stamps - Bunny Girl - techniquejunkies.com/bunny-girl/, and Paint Rings -- techniquejunkies.com/paint-rings/. I also used a verse from Technique Junkies Gifts of Christmas - www.techniquejunkies.com/gifts-of-christmas-set-of-5/. The focal image was colored with Copic markers. The background was inked with a soft blue because that made me think of snow balls! Such a cute Christmas card! 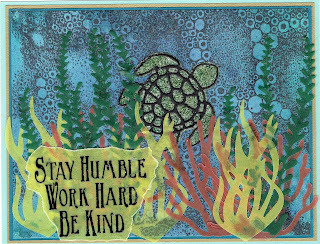 Next on the Technique Junkies November stamps release blog hop is the very talented Vicki Garrett. Hop along to her blog! You won't want to miss that! She will have something wonderful for you to see! Please remember all November release stamps will be 15% off through November 8. During the 30 days of Christmas, every stamp in the Christmas category is 20% off. AND every customer can use my discount code – TJ10Judy for an additional 10% discount! That means if you use my code you would receive 30% off all Christmas stamps. And if you see stamps or products you want that are not Christmas , using the TJ10Judy code will get 10% off of everything else that isn't Christmas. So every card on my blog post today uses stamps that are on sale in some way! So get shopping, stampers! May your day be terrific, and get inky!